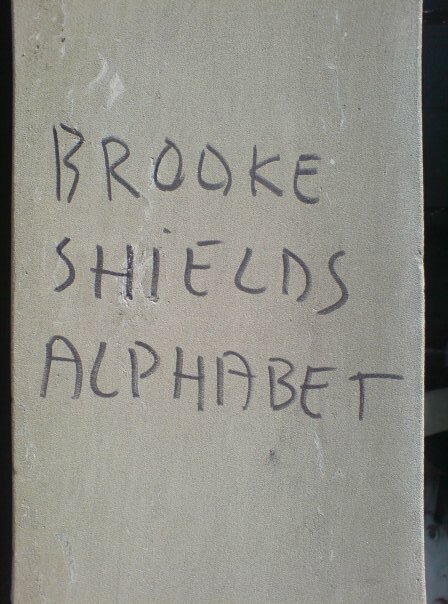 A few weeks ago Jilly and I happened to be wandering across the Tower of London when I noticed some graffiti written in crayon saying, "Alphabet of Brooke Shields". I thought it was odd at the time but carried on upon my business. So, imagine my surprise on Friday when I read in the Metro that this same text is popping up in capital cities across the globe. What's more, there is a whole load of people on the web at places like Flickr trying to find out what this is all about. Metro speculates that it is a viral campaign for a new perfume or alike from Brooke Shields and maybe it is, but I am not so sure. It makes sense to be something cosmetic but Brooke Shields does not strike me as someone who is strong enough as a brand for this to take of? I fear it is going to be some form of global reality TV show, i.e. crossing boundaries etc? Anyway, I grabbed the picture above from a really cool blog that speculates that it could be the name of an album by a new band. To read that blog, click here.